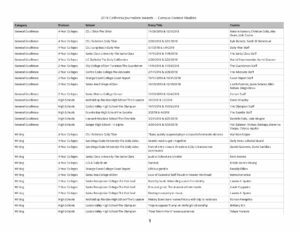 The table below displays the California Journalism Awards Campus Contest finalists by category and division. Finalists are listed alphabetically within each division. You can sort the table alphabetically by school by clicking on the the column header “School” but the easiest way to find your school is to use the search box. A search will begin as soon as you start typing in the box. The more specific you are, the faster you’ll find your results. For example, if you type “Daily,” you’ll end up with a lot of unwanted results. Instead, try the exact name or part of the name of your newspaper or school, such as “Daily Cal” for more specific results. If you still don’t see your specific results, try putting quotes around your search terms. Please report any errors or request any changes to your entry’s title or credits to the contest administrator as soon as possible.